PARIS (AFP) – Roger Federer reached the French Open third round on Wednesday as defending women's champion Svetlana Kuznetsova saved four match points to stay afloat at a rain-drenched, controversial Roland Garros. Federer, chasing a 17th Grand Slam title, overcame a sloppy first set, where he was plagued by 21 unforced errors, and had to save five break points, before defeating Colombian left-hander Alejandro Falla 7-6 (7/4), 6-2, 6-4. The world number one will now tackle German qualifier Julian Reister, the world 165, who had never won a tour match in his five years as a professional before coming to Paris. "Reister? I think I've only warmed up with him once in Hamburg a couple years ago. Obviously I don't remember how he plays," said the top seed. 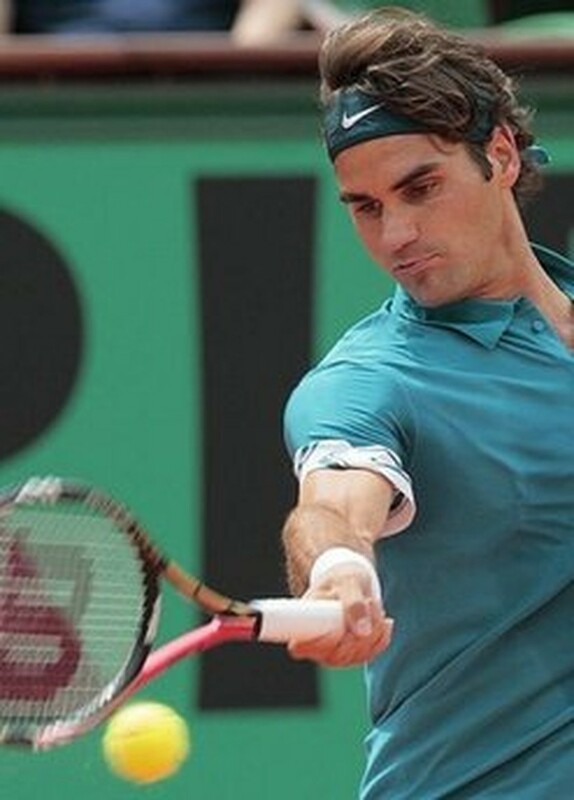 Federer went into his match buoyed by having already defeated world number 70 Falla twice, including in the second round of Roland Garros in 2006. But he struggled throughout the opening set before getting the better of the Colombian world number 70, shrugging off the distractions of two rain interruptions. "A player like Falla needed the first set to have a chance of winning," said Federer, on a day when bursts of heavy rain brought to an end three days of 30-degree temperatures. "He had a good first set where I made too many errors, but he was pushing me at the start. I knew the danger, it was a very tight first set and I was a little lucky." Russian sixth seed Kuznetsova, who defeated Dinara Safina in the 2009 final and was runner-up to fellow Russian Anastasia Myskina in 2006, saved four match points before defeating Germany's world number 41 Andrea Petkovic. After building up a 6-4, 5-4 lead, the 22-year-old German choked in the 10th game of the second set as she served for the match at 40-0. The 24-year-old Russian than ran away to a 5-2 lead in the decider before Petkovic's challenge finally wilted after she had bravely saved three match points. Kuznetsova now faces compatriot Maria Kirilenko. "I just thought that there was nowhere else I wanted to be at that time than in the tournament," said Kusnetsova. "She was going for it, but I have the experience. I made her play the ball, she would have to take the win." With rain wiping out two and a half hours of play, French 13th seed Gael Monfils and Italy's Fabio Fognini were locked in a marathon and bad-tempered clash which was called off in virtual darkness just before 2200 (1900GMT). Monfils had led by two sets before Fognini battled back and the pair were 5-5 in the final set, with the Italian having wasted three match points, when play was halted on Court Philippe Chatrier. The combustible Italian was docked a point for protesting at length that the match should have been suspended at 4-4 in the final set. Darkness also meant that British fourth seed Andy Murray will have to return on Thursday leading Argentina's Juan Ignacio Chela 6-2, 4-4. Swedish fifth seed Robin Soderling, who famously handed Rafael Nadal a first career defeat here last year, crushed hapless American Taylor Dent 6-0, 6-1, 6-1 in just 71 minutes and will next face Spain's Albert Montanes. Soderling's quickfire victory was just short of the record 68 minutes it took Jan Kodes to defeat Zeljko Franulovic in the 1970 final. Women's world number two Venus Williams took 25 minutes longer than Soderling to make the last 32 with a 6-2, 6-4 win over Spain's Arantxa Parra Santonja. Third seed Caroline Wozniacki of Denmark went through with a 6-3, 6-1 win over Italy's Tathiana Garbin, 13 years her senior, and next faces Romania's Alexandra Dulgheru, the winner of the Warsaw claycourt title last weekend.